Today my friend Kim is kicking off Tried and True Thanksgiving Recipes Week! Link up your great recipes this week - she's even having a giveaway! Yummy! I could probably handle having about 3 Thanksgiving dinners so that I could try all the recipes I like. I'll just have to settle for one and narrow down the recipes! The first day is all about Thanksgiving Appetizers. We always have a few munchies out as family visits before the big meal. I have learned over the years though to keep the appetizers a little lighter so nobody gets too full. I've tried a few different things over the years, but have decided to keep it fairly simple this year. Adjust oven racks to low and middle positions and heat oven to 425 degrees. Line two baking sheets with parchment paper. Bake until crisps stop bubbling, 9 to 10 minutes, switching sheets after 5 minutes if they appear to be cooking unevenly. Transfer to a wire rack to cool. *The packaged shredded cheese works better than freshly grated since the packaged is less oily. I'll have to make a double-batch of those! They go fast! 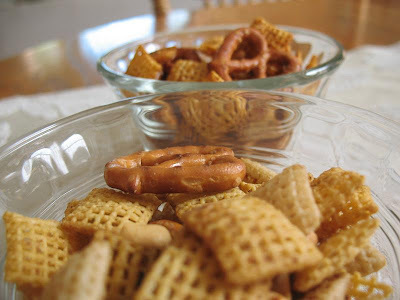 This is a lighter version of a Chex Mix and is actually made in your slow cooker! Smells soooo good! You can find the recipe over at my healthier blog (Stop Eating All The Chocolates). And I think we'll have some cut-up veggies with Ranch Dip. But I'll just use my recipe for Homemade Ranch Dressing Mix to make the dip rather than buying a packet. Other than that, hubs likes to get some really yummy bread, cut it up and have olive oil, fresh ground pepper and balsamic to dip it in. That's about it for our Thanksgiving appetizers! What are your favorite appetizers? 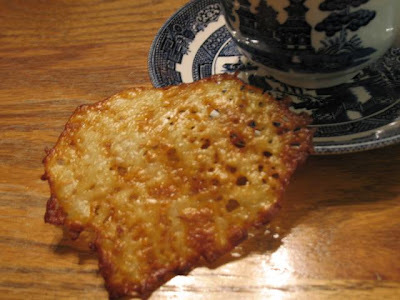 Now get yourself over to Kim's Cooking Blog and link up some yummy appetizer recipes or at least check out her delicious appetizer recipe! Have a blessed Monday friends! Thanks for the shout out my friend. Big CHEESY is EASY size hugs to you! Wow, yum! I think my family would love those...thanks for another great recipe! !